The digital LED screen, about 2,600 square feet in size and divisible into six ads, will feature about some 11 million pixels, Wired U.K. reports, and is the largest of its kind in Europe. Built-in cameras will analyze approaching vehicles—make, model and color—and serve pre-programmed ads aimed at the person it presumes is behind a particular kind of wheel. Marketers have been playing with tracking cars to deliver more specific out-of-home messages for years. Back in 2013, BMW’s Mini used a decidedly more analog identification method, placing human spotters on the side of the road to manually trigger targeted shout-outs to (and photos of) drivers of its automobiles from digital billboards further down the street. The higher-tech approach, used by the screen in Piccadilly, has been picking up steam, with examples popping up in Tokyo and the U.S. Targeted smartphone ads linked to the targeted billboards may soon chase drivers even further down the road, part of the never-ending spiral of swirling clouds of personal data becoming vaguely discomforting sales pitches. Virgin Trains, meanwhile, cleverly combined that kind of vehicle recognition technology with real-time traffic data earlier this year to nudge drivers toward an alternate form of commute time when they might be most susceptible—i.e., stuck on miserably congested roads. 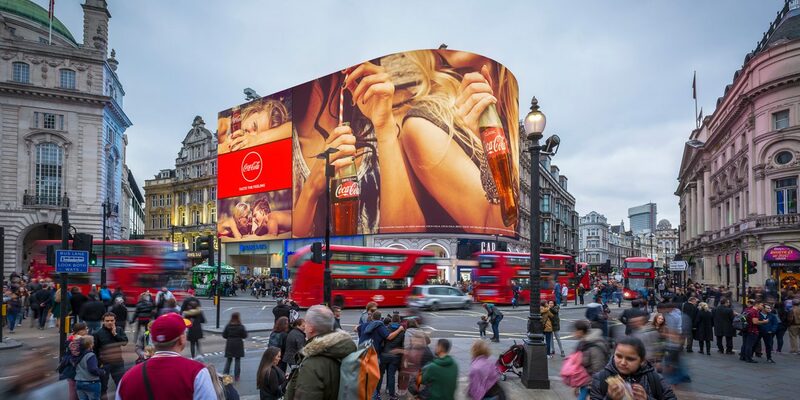 Coca-Cola, Hyundai, Samsung and L’Oreal will be among the early advertisers to the new screen in Piccadilly, though it’s not clear yet whether and how they’ll use the recognition technology—or whether their ads will mostly be a more blindingly bright twist on their old colorful blitzes.